Between July and September of 2015 the artist Arabel Rosillo de Blas displayed her work Freehold at St Alban’s museum as a direct result of winning the UH galleries, Eastern Approaches, art prize. Arabel Rossillo de Blas is interested in the concept of home, she asks what does home now mean in our turbulent times? For Arabel home has been a place of contradiction, a refuge and a threat; she compares the wonder of home when growing up with an awareness of an underlying violence that the home space harboured. She talks about her own family kitchen, a domestic space she names as a ‘women’s area’. Her memories include the feeling of tension associated with the use of knives in the kitchen and the familiar sight of butchered rabbits in the fridge. Hearing these stories one gets the impression of an inquisitive child with a surrealist sensibility; an imagination alive to the unusual force and monstrous significance of everyday things. This surrealist connection is evident in de Blas’s photos of hairs on wet tiles or of knife collections. In a previous installation de Blas had ornate window grills fashioned from white ropes by lace makers and then installed on every window of a grand three-storey town house. The decorative lace grills created a remarkably confusing set of social comments about craft, heritage, security and privacy. This type of commentary is a typical de Blas double offering of beauty and threat. Fellow women artist’s in a similar vein of things ‘uncomfortably domestic’ are Phyllida Barlow, who makes monumental tableaus of suffocating domestic life, sculptural apparitions that are in all senses overwhelming. The other obvious comparison is Sarah Lucas, whose work ‘Two fried Eggs and Kebab’, folds an idea of a woman and the kitchen table into a single utilitarian object. One senses this piece of art would not have been out of place in the de Blas family kitchen. In walking around Freehold one understands what it is, it’s an archetype, it is a model city as well as sculpture. 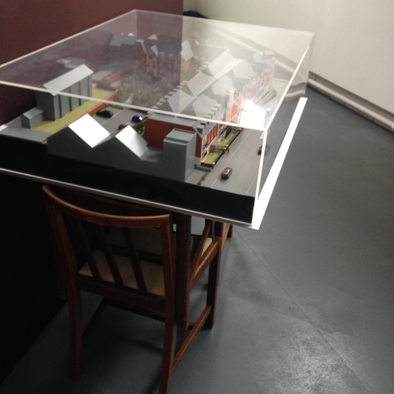 It’s built of wood, board and paint offering ideas about housing, shelter, histories and other personal stories, it’s a cross section of experience gained from knowing St Albans. It’s poetic, each different facet of the installation reports back a little story which goes towards a collective whole. An important innovation within Freehold is de Blas’s reproduction of the floor tiles found at St Albans Cathedral. De Blas has cast the tiles in soap making a poetic union between washing and walking. It’s an unusual combination; one imagines the tiles in a perpetual state of being cleaned and then endlessly trampled upon by footfall. This idea has more in common with progressive theology than contemporary art; but it succeeds in pointing out the paradoxical fragility and brutality of life. It draws attention to the most basic of all things, the ground beneath our feet; a space much taken for granted and increasingly relevant for consideration. A corner wall of soap bars looks like bathroom tiles and emit a stringent perfume that becomes quickly oppressive, they evoke quirky memories of grandma’s bathroom or school showers; a kind a 1950’s utilitarian feel haunts them. Once more the metaphor of perpetual cleansing is deployed, a metaphor that in turn gives rise to the worry of being endlessly dirty. Around another corner of the Freehold construction are floor plans. In these plans of a building, the diagram outline is made by hair stitched onto cloth; reminiscent of Victorian samplers. One reading of this section is that women are no longer stay at home wives, filling their days with domestic chores, decorating bits of cloth with ‘home sweet home’ messages, on the contrary they are breadwinners with mortgages. The walls of de Blas’s model city turn outward and inward, at times they block off, there is a passage way that runs through the middle paved with the soap floor tiles, at other times the walls turn into a mini gallery area with a series of drawings made of brick dust that show us a regularity of building shapes; a dream within a dream. Around another corner is a giant set of stairs; a dolls house at the top announces that Alice in Wonderland rules apply. With this sculpture as with our domestic world, we grow small and then big, scale is a fiction in the model as in the home, some days the house can barely contain us and others days it’s a welcome refuge. In amongst this we are aware that everything we have come to know as fact was once only an idea. The architect’s tabletop-plan once rubber stamped by civil authorities will occupy acres of land and generations of lives. Freehold begins with a map, an architect’s model, an ideal of social living; an architects scale model is presented to us atop stacked dining room chairs, perilously balanced. The use of chairs as stand for the model punches home a reality check about all those little boxes (also known as homes); the four walls that house people’s daily existence, and provide shelter. De Blas has put together a simple assembly that reminds us that the dream as delivered by the architect also has a reality as lived by the inhabitant, that the abstract is an idea for a life but the concrete is the reality of what that life lived is really like. Where is the artist in all this? New developments often have a small percentage of funding for public art works but what the public gets for this is rarely more than ostentatious decorative objects? In fact in so many cases, as with Freehold, it isn’t the big name art work that makes the difference to a neighbourhood, but the endeavors of emerging artists interested in engaging people, groups and ideas in society, making sense of people’s experiences, skills and crafts, understanding the injustices and successes that have been suffered; it is often these creative minds working in a very down to earth way within communities that inspire social repair work. Art has the ability to fold meanings within meanings so that a viewer may well question what is inside space and what outside, what is the model and what is real and of course what if fiction is more truthful than reality? 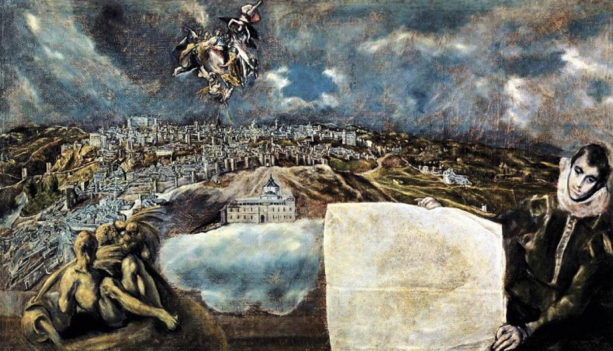 In El Greco’s wonderful painting ‘view of Toledo with plan’ we see the same ideas as in Freehold, the same play between actual and ideal, between concrete and abstract all held in a single frame. El Greco’s painting includes visions, diagrams and ideology. In the foreground is a young man; a ‘real’ person holding a map, an abstract proof of the impressive sprawl and vista of the city of Toledo over his shoulder. Freehold echoes this visual dynamic between concrete and abstract with the architect’s model displayed at the front of the installation and the delicate floor plan made of hair housed within. To expand ideas of reality in El Greco’s painting we also see a sculpted figure, a real unreal person that represents the river Tagus ‘pouring prosperity.’ This metaphorical figure finds a parallel with historical pictures of the soldier and historical comments by residents recorded and displayed by de Blas in Freehold. Further references to hopes, aspirations, desires for good fortune and the centrality of religion are represented by the floor tiles adapted from the Cathedral, bringing a moral and religious qua This quality in El Greco’s painting derives through figures in the sky, visions of spiritual beings, the holy mother Virgin and cities patron saint protector. lity to Freehold. The possibilities of what is real and what is made, what is abstract, what is concrete, what is lived experience and what is ideology, what is faith and what is feared have all been duly noted and addressed in Rosillo de Blas installation which one might rename from Freehold to ‘view of St Albans with plan’. Rosillo de Blas has offered St Albans a view of itself. Freehold was staged in St Albans museum, like so many museum spaces some of its rooms have been ‘white-cubed’, their previous meanings have been emptied out and what remains is a space like those shipping freight containers that are simply x amount of meter cubed volume able to take any cargo. This may seem like a blank cheque for the artist but its much more complex than that. Firstly the white cube space isn’t neutral, the ‘blank canvas’ is still contextualized by the museum of St Albans and carries all the memories and associations of that place. Rosillo de Blas has won the competition with work that’s socially critical, described by a press release as ‘delicate yet disturbing’. How to deploy this kind of art within a museum given over to the social history of the town without coming across as a killjoy pointing out all kinds of social problems or a meddler who would do better to leave the museum as it was for those who like to look at relics? Further to that how to use all those marvelous but obscure bits of the past offered by the museum within the context of her new contemporary artwork without undermining the museum or compromising the artwork? The desire is to have a robust conversation that sees both sides understanding each other better, but these things aren’t easy. Just as it wouldn’t be easy for anyone to come into another persons home and start to make suggestions about how they live. And yet this is the amazingly complex difficult place that De Blas and indeed so many other young artists find and flourish in; delving into social history, excavating people’s lives.